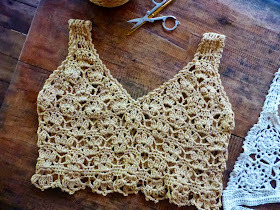 In this project, I used an all-over stitch pattern to make a cropped camisole. 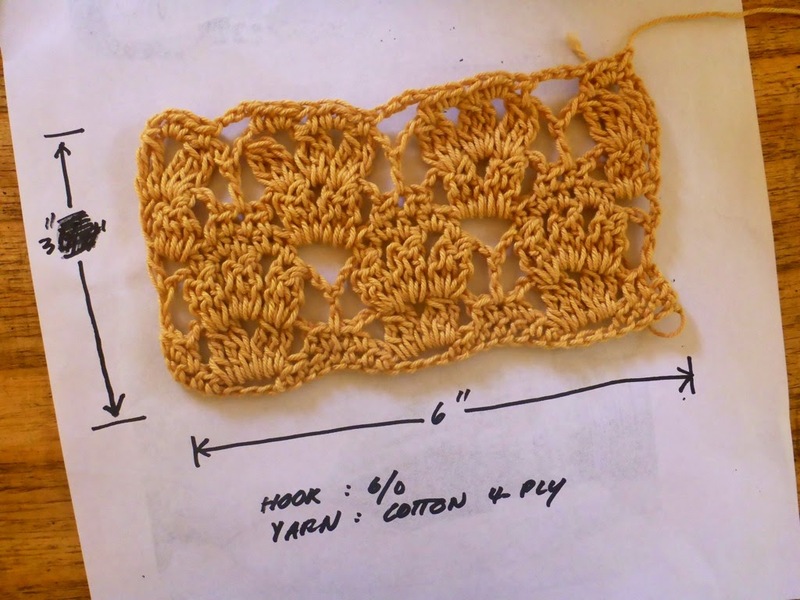 I worked with that stitch pattern again but this time, I made a gauge swatch and made crochet symbols charts showing the modifications done to the pattern. Work in progress: The cropped camisole and the Walkednights Bralette underneath. The basic stitch pattern I used is this. This must be modified to be worked in the round and to shape. So here is the basic stitch pattern. It is worked in rows. 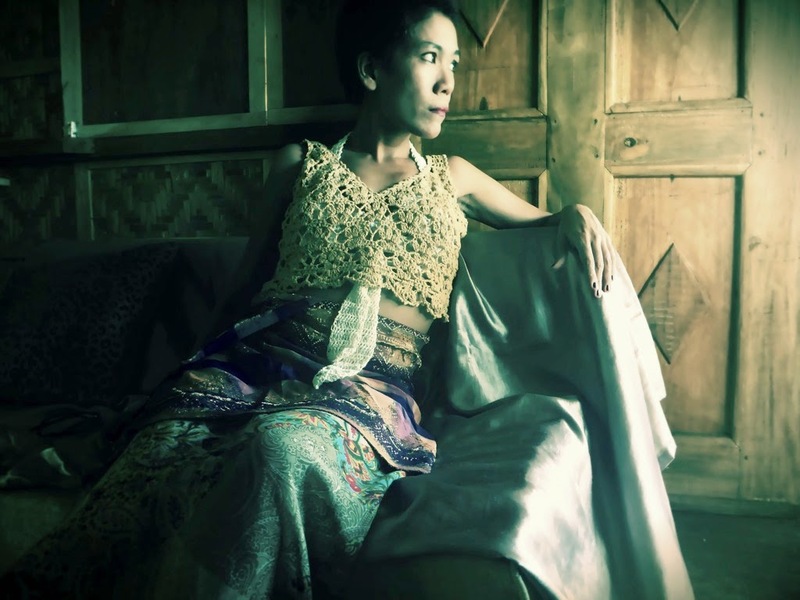 I want my camisole to be worked in rounds, from the bottom up, seamlessly. So I need to modify this pattern slightly so that it can be worked in the round. Here is an example of the modification. 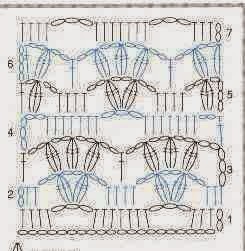 The stitch pattern shown worked in rounds. I made a gauge swatch so that I can determine how many stitches I need for my foundation to fit me, ad so that I can write and make the pattern in other sizes. 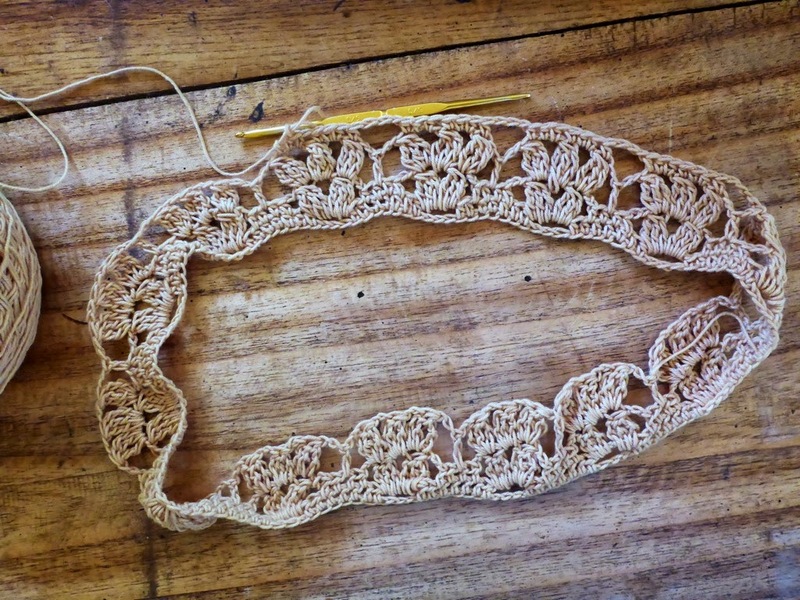 In the meantime here is my gauge swatch. I used 3.5mm hook and 4-ply cotton yarn. 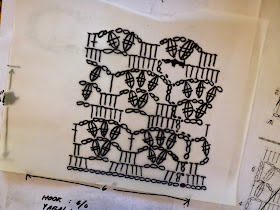 Three horizontal pattern repeats and two vertical pattern repeats is 6″ x 3″ (see photo below). 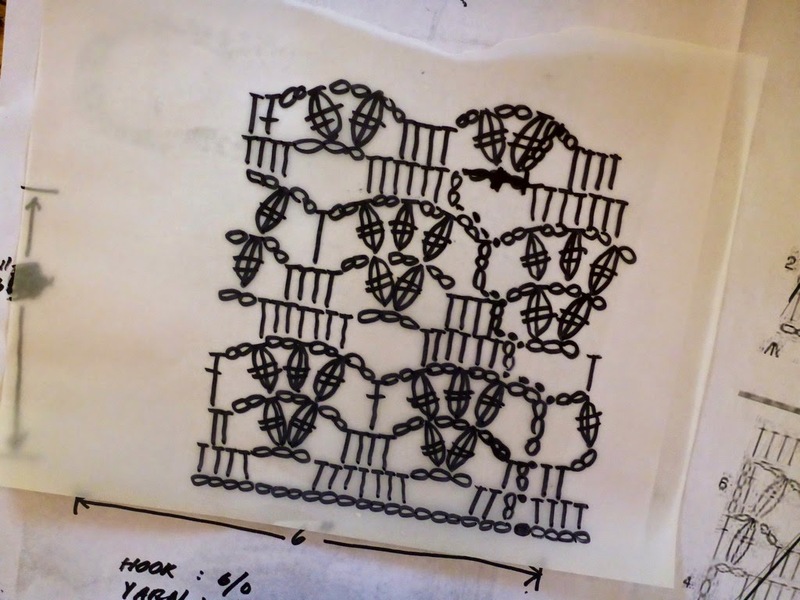 Now, the stitch pattern is worked over a foundation chain of 10 sts. I am making a camisole that fits a bust 28″, and using the gauge, that means I need 14 horizontal pattern repeats with 10 sts in each patter. This is 140 ch sts for the foundation. 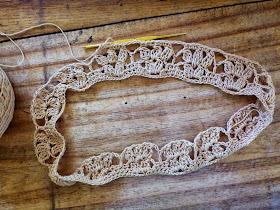 So I started with the foundation chain, join to make a round and worked the stitch pattern. I also made a schematic drawing with the measurements for the finished camisole. Here is the start of the work, photo below. 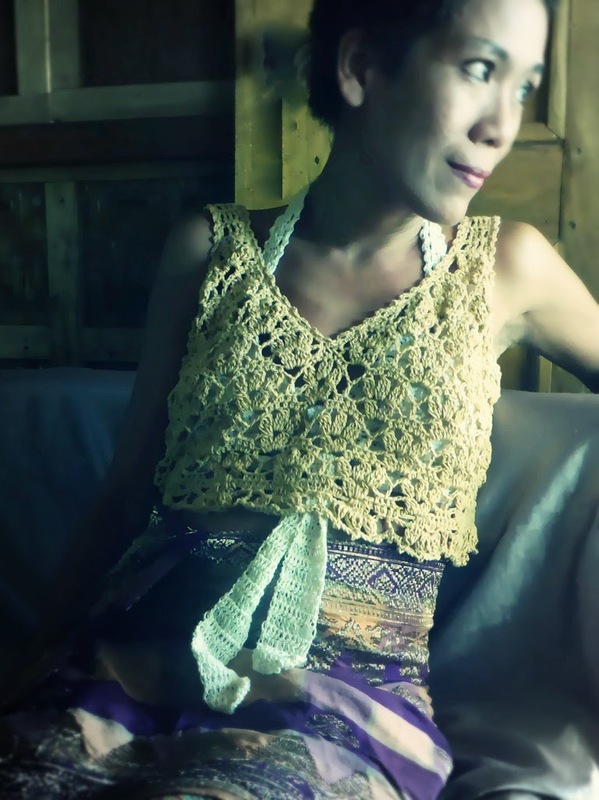 Work begins with a foundation chain and the stitch pattern worked in the round, at the bottom of the camisole. Meanwhile, I started making the modifications to the pattern to make the shaping. 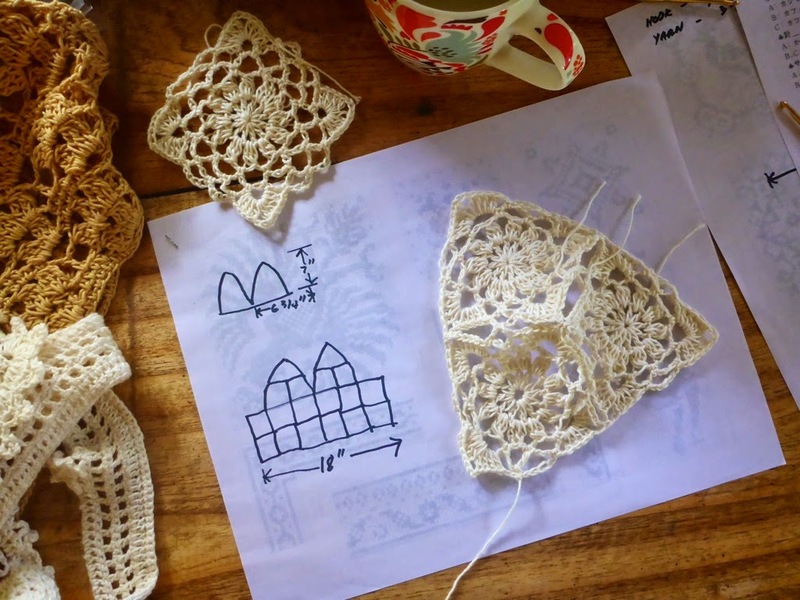 The method is very common, using the crochet symbol chart of the pattern, you draw lines for the intended shaping. Then you follow that when making the modification, photo below. To make the shaped version of the pattern, I drew diagonal lines for the shape and made the modification from that as basis. After completing 3 vertical repeats of the stitch pattern (at least 5 inches tall), I started to divide for the left and right front sides. 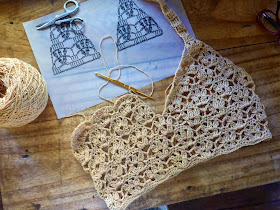 This time the pattern is worked in rows and the shaping is made for the neckline and the armholes, photo below. 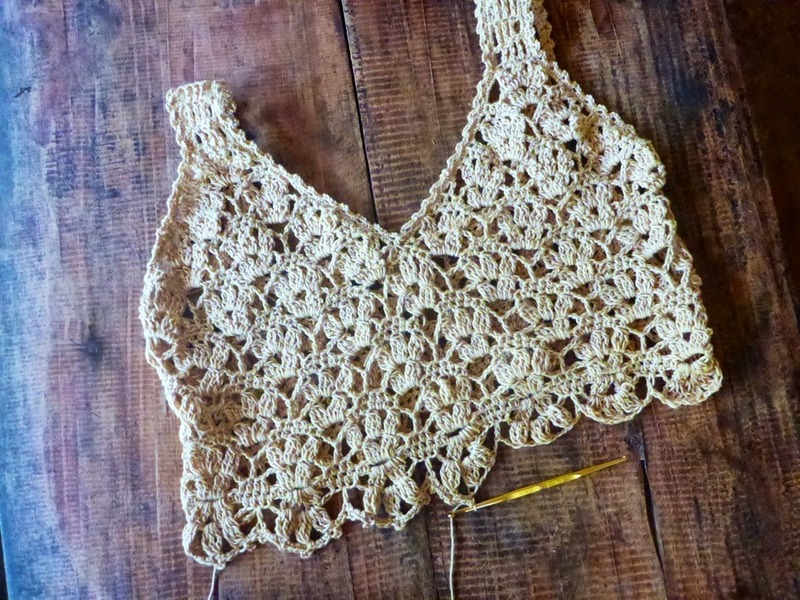 When the piece measures 5+ inches, I begin to divide for the left and right front sides of the camisole – here, I follow the shaping chart I made earlier. Here, photo below, the camisole is completed with the straps sewn at the back. Next will be the edging. I decided to make a simple edging of sc in the first round and 3-ch loops separated by 2 sc in the second round. Left and right front sides are worked in rows, separately, upwards and the straps are completed, then sewn at the back. 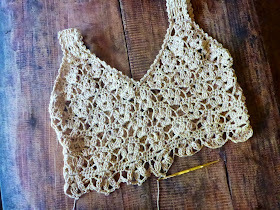 The cropped camisole with the edging completed. Next is a trim for the hemline. 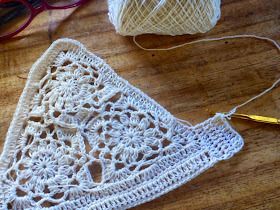 I like the idea of layering crocheted lace garments with the softer and finer yarn underneath. When I finished the simple edging for the neckline and armholes, I added a lace edging at the hem of the camisole. This is the same pattern but I made 3 ch instead of 2 ch between the treble clusters so the hem can flare and loosen out a bit, see photo below. With the neck and armholes edging finished, I decided to lengthen the cami a bit by adding the same stitch pattern along the hem. It is just one pattern repeat with 3 ch instead of 2 ch between the tr-clusters. Here’s the finished cropped camisole. Now I’d like to make a bralette to go with this. 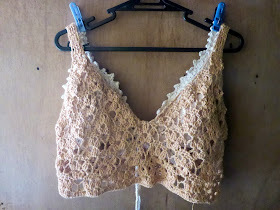 Anyway, I made another bralette for this cropped top, using 3mm hook and 3-ply cotton yarn. 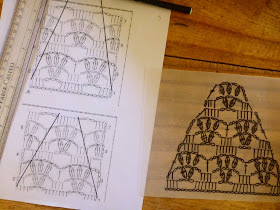 I used the same method of joining 3 motifs together to make the cup, see photos below. The important thing here is to get the measurements right. 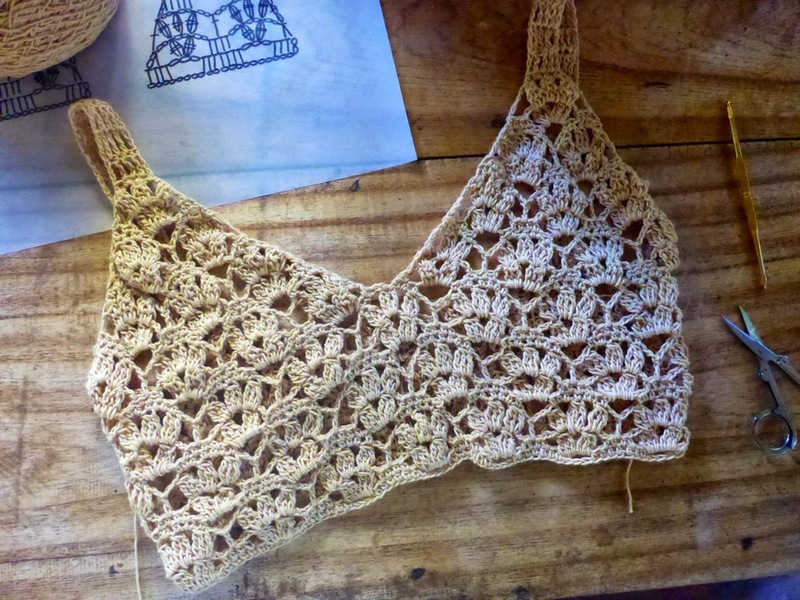 Crocheted bra sizes don’t vary much and can be used to a wide range of bra sizes. A bra cup that measures 6 3/4″ at the base and 7″ high can fit up to a 36″ bust. 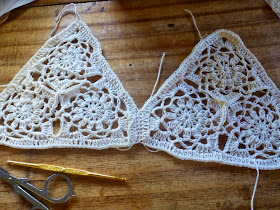 A crocheted bra of this type for larger sizes which require more support is not possible, although this is something that I’d like to tackle next time once I get the large dress forms. For now, I am working for my size, which is very small so I can use a soft bralette. 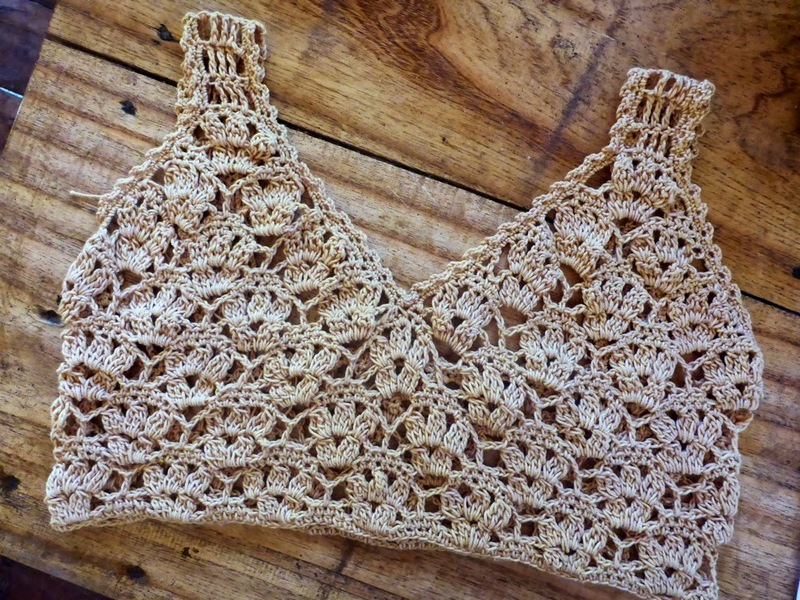 After the cups are joined together, the bralette band is crocheted plus the straps. I decided to make very long straps to wrap around the back and tie at the front. I decided to do this because I have problems tying the bralette at the back. The bralette uses halter straps which I crocheted onto the cups and made a 3-ch loop trim all around the cups and the halter strap. The trim is simple 3-ch loops seperated by 2 sc stitches made evenly along the edges of the cups and the halter strap. Here is the finished bralette – crocheted straps that go around the body and tie at the front and a crocheted halter strap. I added simple 3-ch loop decoration all around the cups and halter strap. 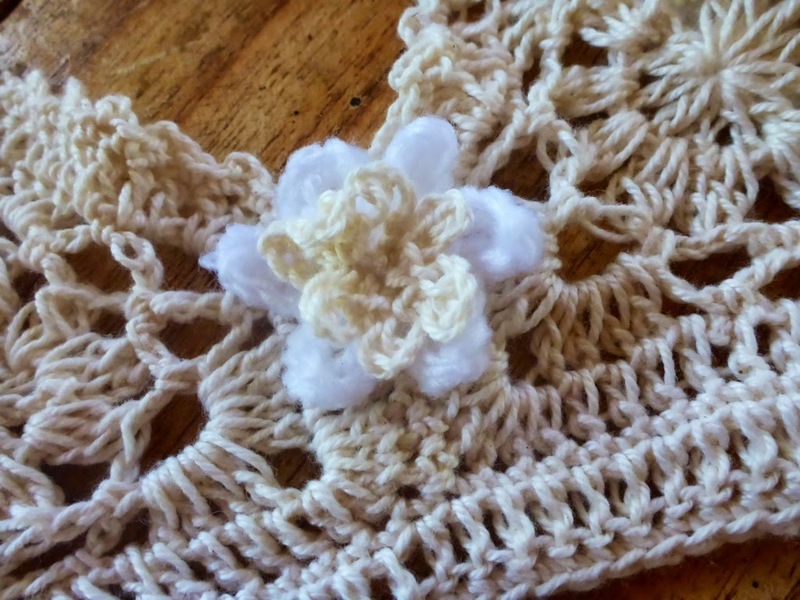 I added this little crocheted flower at the center of the bralette. 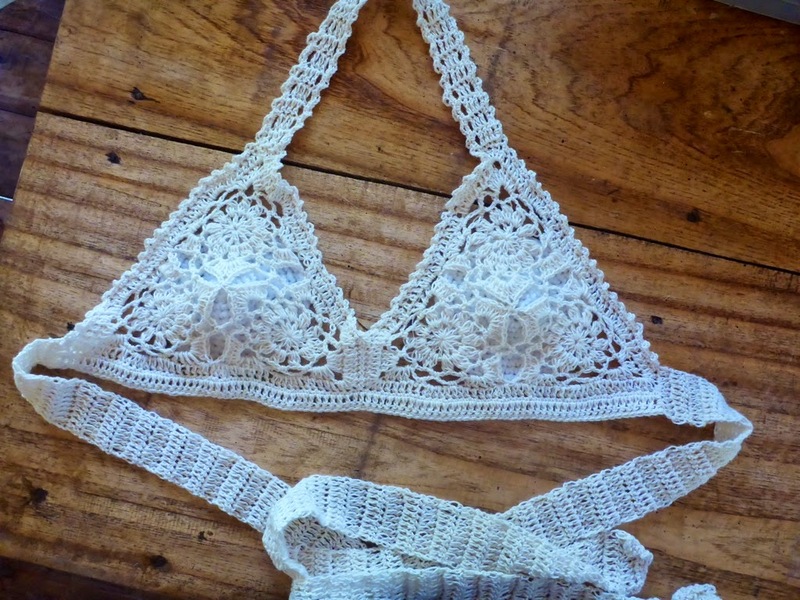 The finished bralette shown above uses bra inserts made from white acrylic yarn. Since I’ve been having difficulty finding bra inserts/pads in the shops, I find that it is easy to make the bra inserts, it is basically a crocheted dome. 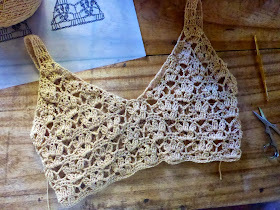 You can learn more about this at Crocheted Bra with Pads/Inserts. 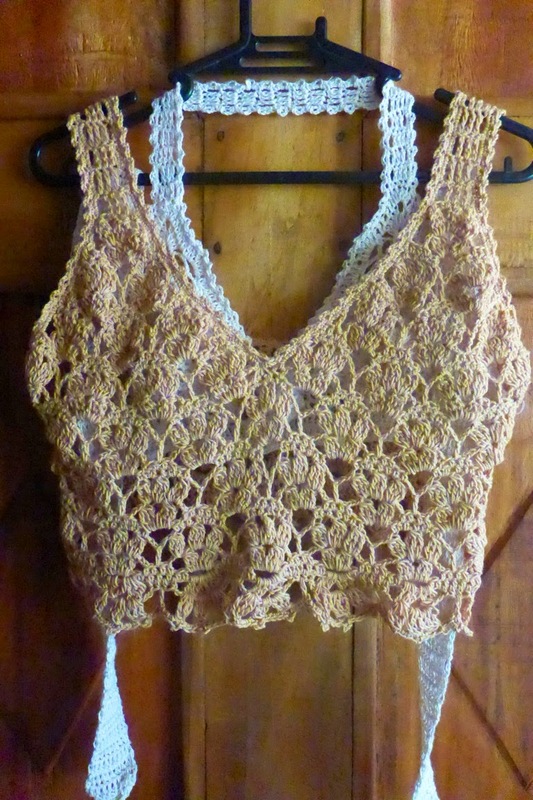 Here is the finished cropped camisole and bralette set. 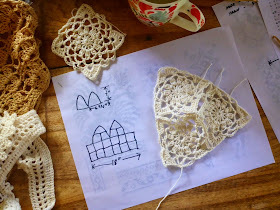 I would like to work more with layering of crocheted lace fabric. The finished cropped top and the bralette go well together. Bralette wraps at the back and ties in front. 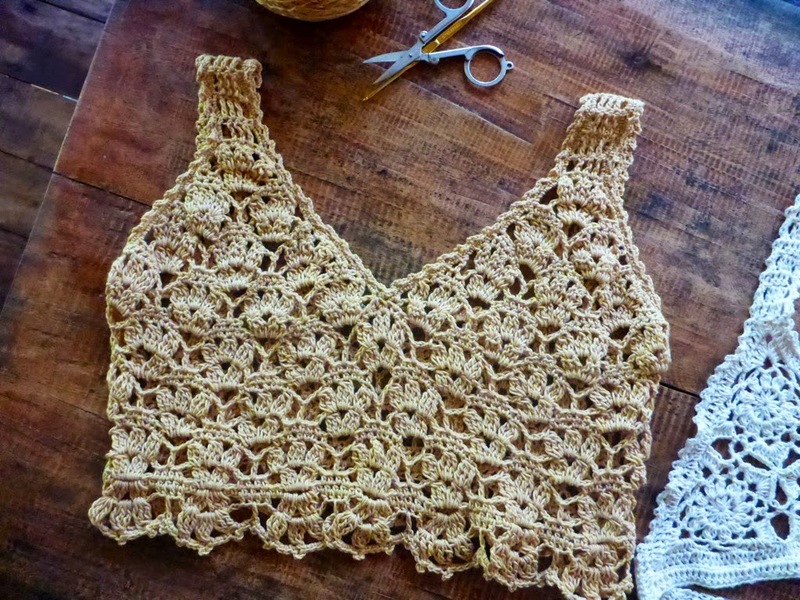 I love crocheted bralettes, they are not only undergarments, but they can also be worn at the beach and they complement nicely with lace crocheted garments.